Hello and Welcome! It is Me, Virginger, the firstest ever Squillion on the Blogosphere. Yes I am. I first appeared 7 years ago. Is it really that long?! Seven years? I still feel like a kitten. You can go here to see my first ever appearance. 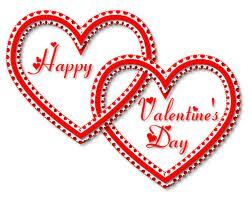 Plus you can check out other posts on February 28 over the years to see updates. With the CB site switchover the history isn't yet posted there, but over the spring and summer of 2006 my litter mates made there way across Mericky and in one case Miss Mandy, made it all the way to the UK to live with Fat Eric! I finally got brave over the last few years and do posts on my own. Once spring gets here I report from outside for Garden Thursday. And since today is Thursday we have a brave little plant that is showing its first leaf. Poor thing is buried in snow now! 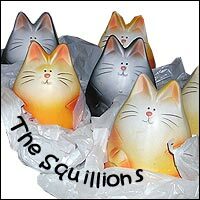 So Happy Squillion Day to one and all. We want spring, but we are getting much more of the white stuff. This is what our front yard looked like on Tuesday morning. White stuff getting thin, being able to see where the grass is. This is what it looked like by 5 PM on Tuesday and it had been snowing, pretty hard for just over an hour. Wednesday morning, mum is guessing around 6-7 inches, but they had started out to tell us that we might get 2-3 inches. So they really missed on this one, the weather guessers were going, blah, blah, blah on why they missed out. Only profession you can be so wrong and keep your jobbie. But even before mum got out of bed, our neighbor Chuck cleared off the driveway. He is such a good guy, he probably does 3-4 people besides his own when it snows a lot. We loves ya' Chuck. Mum will have to do the front porch, patio and such. But that isn't much compared to having to do the whole thing. We will nap, best thing that we can do. Mum will sit and read a book and maybe we can mooch some extra treats from her. Or sit on or near her and steal her heat. 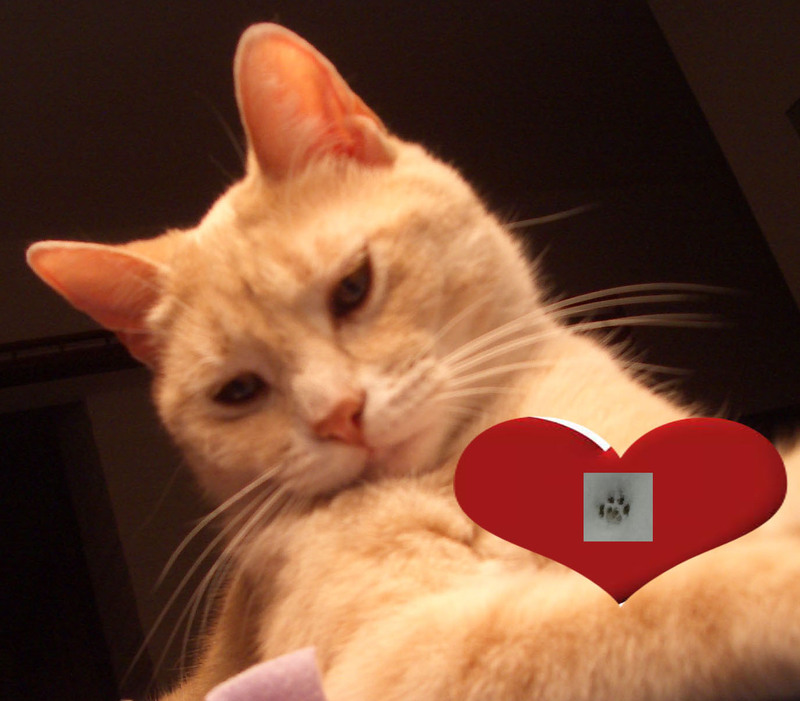 Hope our kittie furiends are safe and warm. Recently there are beans who want to get rid of cats as we kill birdies if we are outside. Hey, if you are having to catch your own foods to survive, then we kitties will do it. Those skills never leave us. I was just sitting on mum's lap, then I took off since I saw something outside. Obviously I can't get outside to do any damage, but deep inside, I could do it if I had to. We made it to Monday, again. Mum said we, really it was her, watching too much of the moving picture box yesterday. A racy and then some fancy dressed people, telling stupid jokes and handing out a little gold man. Plus mum stayed up way too late watching. We chose to sleep through most of it. Mum took the flashy box with her on a walk yesterday. All bright and sunny, for the whole day. But more of the white stuff is on the way in a few days. Oh we have lots of beautyouse sun today. If you don't have any, feel free to teleport over and we will share. We have lots of ham in the big cold box for snacking. Derby getting loves from mum, getting her heat and some from the sun. Ducky and Virginger doing a bit of sun bathing. Mum will have crashcar on later iffin you want to keep up on the racy cars on the moving picture box. No much happening around here for us this morning. Mum is doing her usual chores, the laundry shuffle has started and most likely the sucky monster will be out soon. In the mean time we are napping, watching fevvers and a few snowflakes in the air. 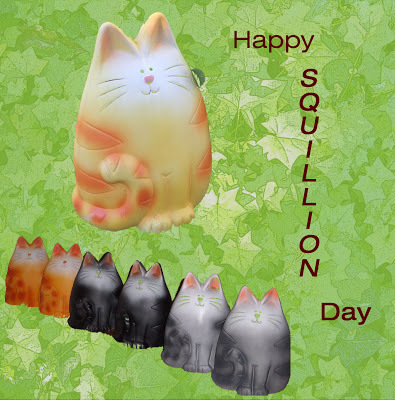 Virginger has reminded us, to remind you, Squillion Day is Thursday February 28th. She will have a post and hopes her fellow litter mates join in to post that day too. 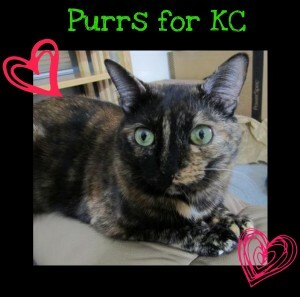 Plus we send our purrs to sweet little KC. She has blocked sinuses and the needed surgery might kill her. Updates at the CB! Let's all purr for KC. Mum came across some old, like from nearly 9 years ago, papers showing what she bought the last time she was in London. This was 2004, long before either of us moved in. Mum even noticed on this last one that her whole credit card number was listed. The card is long gone, but mum blurred out the number anyway. Looks like she was making HM a bit richer! We had a wonderful time helping mum count fevvers last weekend. Here is our tally. Not bad and these are the types of fevvers we normally see this time of year. No sign of the spring birds yet. If you pawticipated, great, we could see from the one map that people from all over put in some counts. 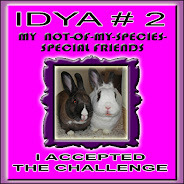 Maybe one of our furiends did! You can go here to explore the data. The most exciting thing was that the hawk showed up on Caturday afternoon while mum was talking on the communicator with her furiend! She went OMG and the hawk took off after one of the doves. We don't know if they hawk caught the dove or not that day. But a week or so ago, some poor dove did get it. We can tell by the fevver mess in the snow! This is looking from mum's sleepy room window outside. Mum went outside then to get closer pictures and not for the squeemish, but, yeah, the poor dove bit the dust here. We are glad we are inside and safe. Napping and getting loves from mum. One of the new things mum added to our blog is a flag thingy! We like it as it shows from where our buddies are visiting from. We are over 30 countries now! If you click on this on our side bar you can get your own. It is a free-bee for the basic thing. Plus for the US and Canada, you can get into it and see which states or provinces have visited. Visitors from all over the world and as of the other day 34 states and the District of Columbia had visited. Hmmm, DC? Maybe the Prez reads our blog! Us snuggling on the couch by the puter. It got all cold again, so we do what we can to stay all warms. Mum went out for a belated purrthday dinner last night. This is what she had and she brought stuff home. Says we don't get anything cuz there is stuff it in that would make us sick. Plus her fuiend gave her a cute little mug with a kittie on it. How nice. HiYa Ducky here. We told you mum said we would have a surprise yesterday. Well I was the one who was surprised. Put in the PTU and taken off to the VET. The PTU moved into the human litter box room. Mum puts it in there as if I get away, I don't have a place to get under to hide. Sneaky she is. Me, innocently sitting by the heaty spot, just relaxcamating just after having my brekkie. She managed to get me inside the PTU, she had to open the top, then turn me over and put me in upside down. Otherwise I spread my legs and won't go in. I won't just walk in the door either. Derby does! Waiting for Dr M to finish his notes. I am healthy,my ears, teeths, heart are all good. No spot 13 invasion. One quick jab for my FDRCC vacine. My rabies is good for three years, so I think I will need that next year. Mum asked about Feline Leukemia, she knows I was negative when she got me and did I need to be retested. Doc said no, since I am not out and about with other kitties, either outside or at shows. Derby is negative too, so we should be good to go and no re-test or vaccine needed.Unless we have to go back to the kittie spa. Me back inside and waiting to go home. I did get back in the PTU, through the door with no problem. Going home, heck yes I will get back inside. Yes, mum got a video with some highlights. I still love mum, even though she took me to the VET. I made sure I snuggled with her and gives her love back. Plus she was super nice and for lunch yesterday we got treats of turkey, ham, string cheese and stinky goodness. Plus, I am happy the appointment was yesterday, it was warmish, today it is cold with snow. Yeah, we are glad we are cats. Nap and play as we want. Watch fevvers. Mum didn't watch much of the fevvers on Sunday. She was busy doing other stuff. We have stuff to do on Monday. Mum says it will be a surprize. 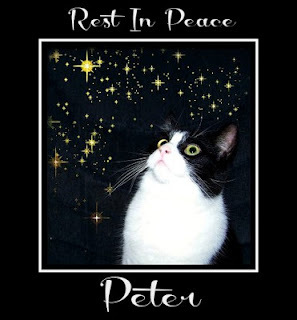 Updated at 10:45 AM: Peter Pete went to The Bridge. We has a sad on Sunday. Sending healing purrs to Peter Pete from Purrchase To Dream. He is at the mergency VET after collapsing. 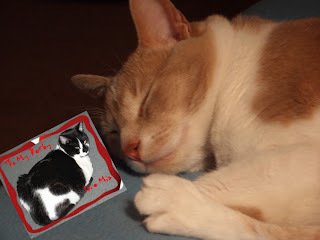 Mum says thank you for the purrthday wishes. It was a good day, she made good soup, watched fevvers, which included an attack by Mr Hawk! Mum gave us lots of treats as well so we could cellybrate with her. It is a big day for her, her age now ends in a zero! Plus since it is Caturday she thinks she can sleep in. We will see about that! That must mean mum is 100! Yep, we think so. She is ancient. We helped mum count fevvers on Friday and mum says we saw 11 different types of them, including 3 types of woodpeckers. Just our usual ones we see. We will count again today as well. But mum got mad, she says she thought the fevvers have been eating the seed so much faster. We we couldn't tell her, it is really the sqwerls! Mum saw them, we have up to 6 we see at any one time. One of them jumped to the fevver bath, which is all snowy and frozen. Then with a big leap it jumped to the feeder! Mum was not happy. So mum went out and scared the sqwerl away and then she got the fevver bath to lay down on the ground. No easy thing since it was frozen to the ground. Mum now hopes that they can't make the jump into the feeder. She says they get enough with what the stupid doves through on the ground for them. Back to the party for mum. We will cellybrate her many decades of life, we have only been around a few more recent years to share her life. So for mum, we have some ham and cake. There is nip in the cake, just so you know. Plus some fancy eats and drinks if your beans stop by to say hello. Starting today is the bird count anyone can pawticipate in. 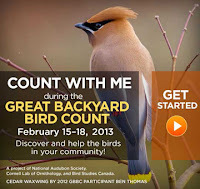 Yes anyone, this year, for the first time it is a GLOBAL count. It is furry basic and you can do it at home, go to a park or some where the fevvers hang out. 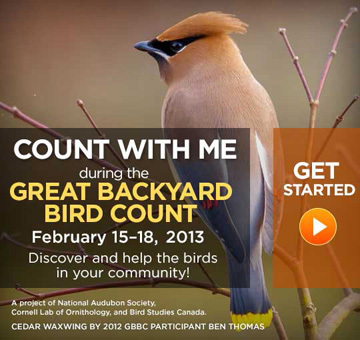 Watch for at least 15 minutes and record the number of each type of birds you see. Then report your results on line. So Friday, Caturday, Sunday and Monday. Mum say Monday is a hollyday for most beans in Merikcy, so they can stay home and help you count. Or you send them out to count somewhere for you. You know we will be counting along with mum. We love watching the fevvers. 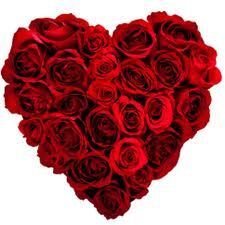 Yes, we are cellybrating today, thinking of our sweeties. 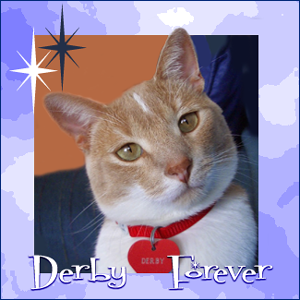 Derby dreaming of his sweetheart Princess Mia Bella. 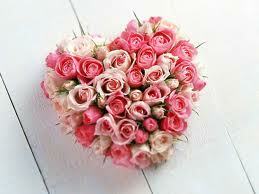 Gosh, it has already been 7 years since she left me an annoymous message telling me she was a secret admirer. It took me a couple of days to figure out who PMB was, but I did.